Ag Secretary Tom Vilsack, with HyVee CEO Ric Jurgens. U.S. Ag Secretary Tom Vilsack says Americans have “serious challenges” with sodium and sugar and a U.S.D.A. pilot project in the new year will try to find a way to steer shoppers to more nutritious food. Vilsack toured a Hy-Vee near the Des Moines airport this morning to see a new system which rates the nutritional value of grocery products. It’s called the NuVal system. Coffee creamer, for example, gets the lowest score of one, while unsweetened shredded wheat in the cereal aisle gets an 83 out of 100. Vilsack notes that in the last decade, about 90,000 new products have been introduced in the country’s grocery stores. “Consumers obviously have more choice, but the question is are they making the right choices for themselves and their families,” Vilsack said during a news conference in the store. 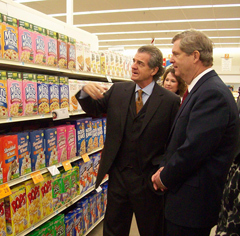 Vilsack joked a bit about the nutritional labels on the food sold in grocery stores. “You know, if you take a look at a label — unless you’re a dietician or a chemist or a doctor — it’s really hard to determine between two products which is the best product for you and your family,” Vilsack said. According to the ag secretary, that’s why the NuVal system the Hy-Vee grocery store chain is using is so intriguing. While the system reviews all the things are that are printed on the label, it comes up with a single number to signify the product’s nutritional value. In 2010, the U.S.D.A. will launch the “Health Initiatives Program.” States will be able to apply for $20 million in U.S.D.A. grants to test projects that get consumers to buy more fruits and vegetables. “We’re encouraging states to participate in this program to see if there’s a way in which we can really incent customers to make the right set of choices,” Vilsack said. Vilsack has slimmed down in the past year and he credits “better” eating choices. “I mean, I have to sort of walk the walk here and, you know, the more I learn about this, the better consumer I become,” Vilsack said. Vilsack ran in four marathons one year when he was Iowa’s governor and Vilsack quipped that he hasn’t fully recovered. But Vilsack is still running, when his schedule allows, about five or six miles at a time.